When building a school from the ground up, one of the decisions you’ll need to make is how many areas you’ll have that transition from one type of flooring to another. Will there be a lot of transitions, or will the school mostly have one type of flooring throughout? Once that decision has been made, it’s time to select your transition strips. WHY DO YOU NEED TRANSITION STRIPS? Transition strips are needed to join two different sections of the school, like a classroom and hallway or another area where the flooring type changes. They are an essential safety feature, smoothing the transition and providing visual contrast to help prevent trips and falls. We recommend installing transition strips whenever two types of flooring are coming together, but they’re most important when transitioning between two different thicknesses of flooring, like a thick carpeted area joining a concrete area. In these scenarios, the transition strip not only promotes safety, but also helps protect the edges of the floor from damage. 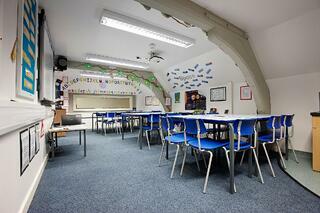 Transition strips are especially important in schools for several reasons. 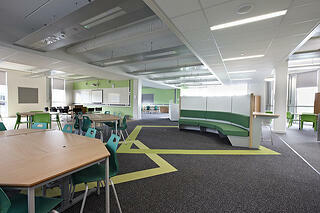 Flooring Protection: First, they protect the floor edges from the constant heavy foot traffic of students and teachers. Smooth Flooring Transition: Second, they create a smooth surface for wheelchairs and rolling carts carrying televisions or other classroom equipment to travel over. Safety: Lastly, the safety of students is one of a school’s top responsibilities, and the transition strips help eliminate trip hazards. An expansion joint will be needed wherever two pieces of flooring may expand or contract with weather and temperature. Typically, this means any area that’s outside or inside but exposed to weather, like an entryway for example. Almost every building will have some type of expansion and contraction, even if it’s just because of the internal temperature, like when the interior of the school is very warm, and the ground underneath the building is very cold. This can cause the subfloor to expand and contract. Additionally, any type of concrete will have some expansion and contraction. In these situations, you should not use a standard screw down, glue down transition strip because these can lead to cracks in the concrete, deteriorating its integrity and looking unsightly and worn. Instead, you have two main options. First, you can choose a transition that has an accordion-type PVC in the center that will allow for expansion and contraction. These transitions are adhered to either side of the flooring, and the expansion and contraction occurs within the accordion in the middle of the PVC. Alternatively, you can have a floating transition. These are typically made of metal instead of PVC. They screw down on one side, leaving the other side able to contract and expand with the floor. Both options work well, so it’s mostly a question of aesthetics when choosing the profile that’s best for your installation. But, metal is used more often for transitions joining carpet over concrete because it preserves the transition strip in addition to the expansion joints. Over the years, we’ve seen architects and contractors working on schools choose a two-part system called a clip-top system. This profile has an aluminum base that’s installed to the subfloor first, and then the flooring is put in - carpet, tile, or any other type of flooring. The top piece is usually a PVC that taps down into the aluminum base, covering the edges of the flooring on either side to make the transition smooth. This is the most popular profile because PVC is very durable. It’s going to hold up longer than many other profiles in a school’s heavy-traffic environment. In some situations, you could use a simple, flat tap-down metal, which is sometimes a less expensive option. That profile is just a one-piece transition that screws down onto the floor making, either a ramp or go-between two similar flooring surfaces. HOW MUCH WILL TRANSITION STRIPS COST? It’s possible to get very inexpensive metal transition strips for just a couple of dollars per foot, but we recommend using Gradus transition strips. Gradus’ standard PVC transitions usually cost $4-5 per foot, while Gradus’ metal transitions can range from $3-5 per foot. 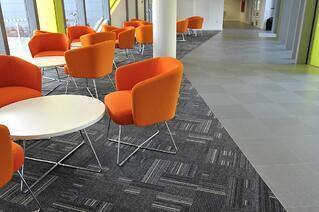 Gradus profiles tend to be a bit more expensive because of the quality in manufacturing. 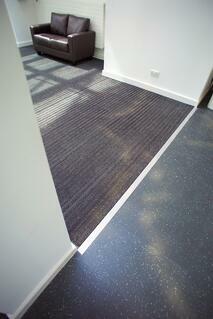 The product holds up longer - we’ve seen schools’ Gradus transitions last 5-10 years before needing to be replaced. Their longevity and durability mean less frequent replacements and repairs, so while the upfront cost is higher, you’ll often save more money down the road when you choose a Gradus profile from the beginning. 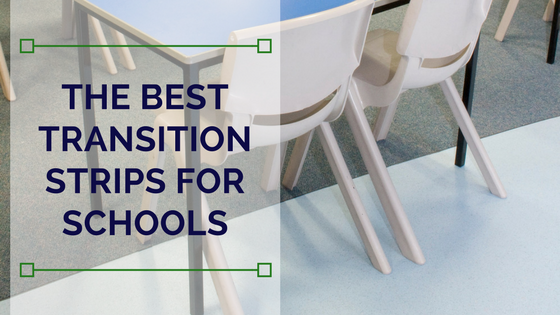 Transition strips are a necessity in any school to keep students and teachers safe and to protect the floors from damage, so it’s important to do some research and choose the profiles that fit the school’s aesthetic and budget. If you have any questions about transitions or other flooring accessories for your school, one of our product specialists will be happy to help.